This year, two students were selected for the Jernberg Scholarship. In 2014, the Board of Trustees established a scholarship that celebrates and awards academic excellence and named it in honor of President Emeritus James Peter Jernberg Jr. who faithfully served the school as president for 26 years. Mr. Jernberg is considered one of the most influential educators in independent education nationwide, so a scholarship in his name comes with much honor and prestige. This year, Miles Johnson, from Madison, and Paul Bautista, from Brandon, have received the honor. As highly qualified applicants who started out in a much bigger group of candidates, these two had to complete testing, essays, recommendations, and school and financial applications in order to be considered for the scholarship. Once becoming finalists, they completed on-campus interviews, and finally were selected as the 2017-2018 Jernberg Scholars. The scholarship will cover tuition, fees, and other costs of attending JA. Miles Johnson came to JA from Christ Covenant last year. He had applied for the Jernberg Scholarship for that year but did not receive it, giving him a strong determination to go for it again. Miles says the aspect that most attracted him to JA was technology. The Tech Center and the Learning Commons won big points with him, and he uses both areas frequently. He really enjoys his classes, especially sports broadcasting with Ms. Lawrence where he experiences hands on learning with modern broadcasting technology. Miles says that for his personal goals as a student at JA and a Jernberg scholar, it’s not about winning the race but how you run it, and he plans to work hard under the examples he has at JA and his church, Highland Presbyterian. Paul Bautista comes to JA next year from Brandon Middle as a ninth grader. Paul was looking for a school that would challenge him as a student and as a young man. “I wanted a better education so I can live my life to the greatest I can, and I saw that the best place to do that was here,” he says. Paul was also really attracted to the technology opportunities at JA as well as a few other values of the JA Way. “I like this place because it emphasizes community, not just excellence.” Paul applied to four boarding schools as well as JA and at first was looking forward to his opportunities there. But a visit to JA and its community showed him that he could be given a challenge right here in Jackson at a school that already feels like home. He is very excited to start next year. The scholarship celebrates the influence of Peter Jernberg’s significant impact on the world of independent education with the hope that each recipient will, in turn, become an individual who makes an impact on his school and community through academics and character. Qualified students may apply for the Jernberg Scholarship at Jackson Academy for the 2018-2019 school year beginning in the fall of 2017. 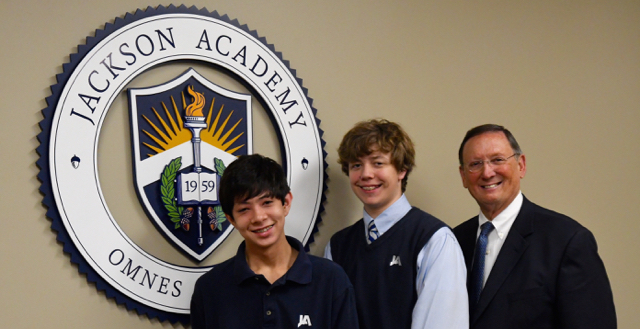 More information on the Jernberg Scholarship is available at jacksonacademy.org/jernbergscholars.